Fantasy comes in all shapes and sizes. I enjoy epic fantasy (like The Lord of the Rings), sword & sorcery, horror, urban fantasy, paranormal romance, dark fantasy, weird westerns, and virtually everything in between. But more and more these days I find myself drawn to work that truly strikes out into new territory. W.L. 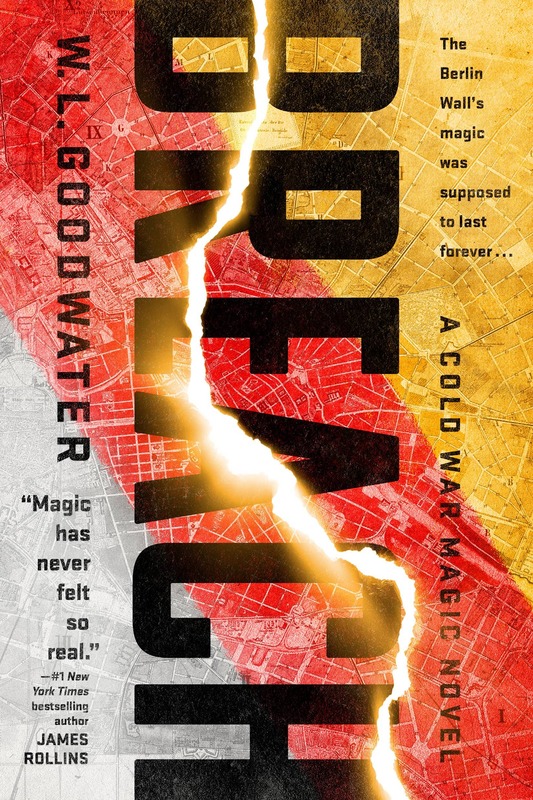 Goodwater’s debut novel Breach is a great example. It was published late last year by Ace, and is described as the opening novel in a new Cold War fantasy series, in which the Berlin Wall is made entirely of magic. When a breach unexpectedly appears, spies from both sides descend on the city as World War III looms ever closer. I discovered Breach almost wholly by accident, as I browsed the shelves at B&N a few weeks ago. I knew nothing about it, and the cover didn’t particularly grab me. But the brief blurb on the back cover did, pretty much immediately. As modern fantasy goes, this is about as original as it gets. This is the kind of book that kicks off a whole new sub-genre. Alternate history political thriller fantasy? Cold War apocalypse fantasy? Whatever; I’m on board. Here’s the blurb that grabbed my attention. Karen, a young magician with the American Office of Magical Research and Deployment, is sent to investigate the breach in the Wall and determine if it can be fixed. Instead, she discovers that the truth is elusive in this divided city — and that even magic itself has its own agenda. Breach was published by Ace on November 6, 2018. It is 336 pages, priced at $16 in paperback and $11.99 in digital formats. The cover was designed by Pete Garceau. See all our recent New Treasures here.